Margaret Ewing Lafferty, a resident of Brethren Village in Neffsville, passed away quietly on Sunday, December 3rd. She was 98. Born in Rehoboth Beach, DE on July 6, 1919, Margaret was the daughter of Catherine Lingo Ewing and Benjamin Burton Ewing, Sr. At the time of her death, Margaret was the oldest living Rehoboth-born native. 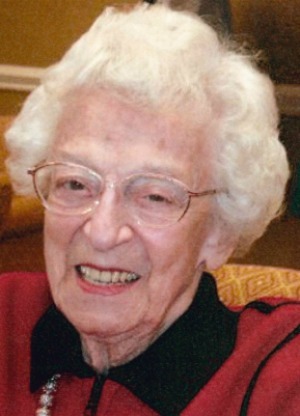 One of only nine members of her Rehoboth Beach High School class, Margaret attended the University of Delaware in Newark, DE and earned her degree in elementary education in 1941. While at the University, Margaret met her future husband, John E. H. “Jack” Lafferty. They were married in 1942. During the war years, Margaret lived in Rehoboth and taught school until her husband returned from the service. In 1949, Margaret and Jack moved to Lancaster and resided in Manheim Township. Margaret was home with her children until her youngest entered junior high, when she resumed teaching fourth grade in the Lampeter-Strasburg School District. She retired in 1985. Margaret was an avid bridge player and enjoyed playing well into her nineties. She loved cheering on the Philadelphia Phillies, and was an excellent cook and baker. Margaret was also a member of the Towne Club. She and her husband were active members of Grandview Heights United Methodist Church, having joined the church soon after its founding upon their arrival in Lancaster. Margaret’s favorite times were spent in her hometown of Rehoboth where she spent several weeks every summer visiting with friends and family. Margaret is survived by her daughter, Dee Lafferty Pugh of Bryn Mawr, PA (the late James Pugh) and son, Jed Lafferty (Pam) of West Chester, PA, as well as two grandchildren , Katelyn Lafferty Crook (Jeff) and John B. Lafferty, and two great-grandchildren, Madeline and Harrison Crook. She was preceded in death by her husband Jack, her sister, Delma, and three brothers, Ben, Hall, and Willard. Relatives and friends are cordially invited to attend a Memorial Service celebrating Margaret’s life on Friday, December 8 at 2 p.m. at Grandview Heights United Methodist Church, 888 Pleasure Road, Lancaster, PA 17601. The Reverend Andrea Brown will preside. Friends may call from 1 till 2 p.m. at the church. A graveside service will be held at Epworth Methodist Cemetery on Henlopen Avenue in Rehoboth Beach on Saturday, December 9 at 1 p.m. Contributions in Margaret’s memory may be made to the Towne Club Vocational Scholarship Fund, c/o Dottie Grove, Towne Club Treasurer, 2001 Harrisburg Pike, CW 145, Lancaster, PA 17601, or Grandview Heights United Methodist Church. We live just down the hall from Margaret, became good friends and shared many interests. Both devout Philly fans, bridge players, and Eleanor & Margaret both elementary school teachers. We learned to love her and enjoyed the many times she would just drop in to talk. We will miss her in many ways and especially at Christmas when she always brought us her delicious sugared pecans. Dear Dee and Family ~ So sorry to hear of the passing of your Mother. Dear Dee, I’m so sorry for your loss. I saw Margaret eating at Old Hickory Grill with a friend a couple months ago. She was pleasant and knew who I was. We had a nice talk. I’ve been sick lately so don’t know if I will get to the service. But please know that my thoughts and prayers will be with you and the rest of your family. Let me know if there is anything I can do. Thank you for this. I enjoyed talking to your dad the other day — always a charmer. So sorry to hear you’ve been sick, and I’m hoping you are doing much, much better. My mom just told me about Mrs. Lafferty’s passing. She was one of my favorite teacher’s. I still have the Christmas angel holding a Christmas tree she gave me when she drew my name at Christmas time. I thought it was interesting that I married into a family that grows Christmas trees in Western Massachusetts. I am so sorry for your loss. We so enjoyed hearing your story. She loved teaching and Christmas trees. You might like to know that every year her Christmas card was one with a Christmas tree, usually from Caspari, and her favorite gift to give youngsters, young and old , was an ornament. What a lovely tribute you both gave to your mother at her funeral. I remember so many of the things that you talked about , having heard many of them from my mother. All the food she got ready for her trips to the shore, and going out to smoke in the parking lot, and going to Billy Penns for the tomato soup, even if they didn’t meet up at church the two of them made sure they got to Reflections for lunch, after they knew church was over, every Sunday and then there was bridge club, your mother would yell at my mom for making a dumb bid, and to Mary Jane for falling asleep, and Mary M. For always being late, I loved hearing all those stories all those years they played together, and now to think that three of them passed away this year, how very sad. I hope they have gotten together and are all still playing bridge, and going out for lunch, and having a good time , talking about their lives, and their kids, and grandchildren and great grand children, Rest In Peace Ladies. Thank you for the kind words. Mother will be missed… but I’m sure by now she and the other heavenly ladies already have a bridge game going! Thanks so much for the bridge memories and laughs! They were quite a crew. Your mom sent me birthday cards … in turn, when I would order a case of small aluminum broiler pans, I would take a supply to your mom as well as mine. And then there were the hearing aids that Mother got … after she couldn’t hear what people were saying in a bible study group at Grandview … a bible study group your mother pushed her to join … so Mother went out and got hearing aides … about the same time your mom left for Florida and missed about the remaining half of the study group meetings.